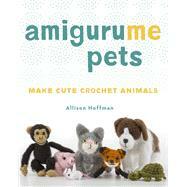 Crochet yourself a cute pet with the irresistible art of amigurumi! The dog and cat sections include recipes for individual body parts with information on how to combine the components. A helpful dog and cat breed guide will show you which parts to combine to create a specific breed or even designer breed (Goldendoodle, Puggle, Yorkipoo), or use your imagination to create your own unique and lovable mixed breed. All other projects include specific patterns for each animal. Give them as gifts . . . or keep them to snuggle yourself! Most patterns are created to scale with the dolls from AmiguruME, so make a best friend for your AmiguruME doll to enjoy. Allison Hoffman has been designing amigirumi patterns since she learned how to crochet. Author of the book AmiguruME (Lark), her work has been seen everywhere, from The Martha Stewart Show to Conan, as well as in art exhibits around the United States. She is frequently featured in both pop culture and craft publications, such as Crochet Today, Interweave Crochet, boingboing.net, perezhilton.com, and more. She blogs at CraftyisCool and sells her patterns on Etsy and Ravelry.com. She teaches in Austin, TX, where she lives with her husband, three boys, and two (non-crocheted, real-life) Labs. You can follow her on instagram.com/craftyiscool.